If you're like most people, you would prefer to get your daily workout done at the gym,or better yet, outside,than to do it at home. There's something about the fresh air of an outdoor workout or the invigorating atmosphere of the gym that helps to get your blood pumping and keep you motivated. However, there will be days when neither outdoor workouts nor trips to the gym are convenient, appealing, or even possible. Maybe your outdoor run has to be nixed because an un-forecasted torrential downpour hit your area. Perhaps you can't make it to the gym because your meeting ran late at work and you have to get home to watch the kids. Or maybe you're just not in the mood for your usual outdoor workout and the bustling nature of the gym just sounds overwhelming. Whatever the reason, there will be days where an at-home workout is the best option available to you. When those days roll around, it's always good to have the necessary equipment and accessories to make sure that you can still get plenty of exercise. Of course, major home gym investments are a huge plus. If you have a treadmill, strength machine, or stationary bike just sitting in your basement, then your home workout woes are solved! You can just go downstairs and do some approximation of the workout you would normally get at the gym. Heck, when you have high-quality, heavy-duty exercise equipment at home, you might not even need that gym membership anymore! The problem is, not all of us have treadmills, elliptical machines, weight machines, or stationary bikes. Those pieces of equipment are expensive and take up a lot of space. If you are saving up for a different kind of big purchase, or if you simply don't have enough room in your small apartment for a home gym, then you probably don't have a ton of home workout equipment. But just because you don't have the big home workout equipment doesn't mean that you can't build up a collection of great exercise accessories. Here are just a few smaller purchases that can be perfect for building a fulfilling indoor home workout on a budget. If you are patient (and have a large enough collection of dumbbells! ), then you can devise quite the effective strength workout for yourself using nothing but nice, compact hand weights. 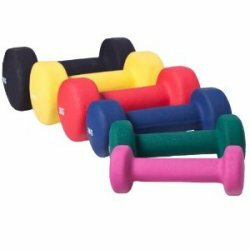 Buy a handful of different hand weights, with pairs in a variety of different weight classes. Then, do a bit of Googling to find an ideal strength training regimen that uses hand weights. Hand weights are great because their size means you can lift them in a variety of different ways. Depending on which type of lift you are doing, you can work entirely different sets of muscles, making a set of hand weights perfect for a full upper body workout. Plus, hand weights can easily be organized on a compact rack or stored in the closet, so they won't take up a ton of space. Like with hand weights, you can use a balance board to work different muscle groups throughout your body. Just standing and balancing on a board might not seem like much of a workout, but by alternating between squats, single-leg balancing, push-ups, and several other variations on the exercise, you will not only improve your balance but also the strength of your core. Skipping rope might seem like a child's hobby. However, jumping rope can also be an incredible workout if you do it right. Start simple, just skipping rope like you used to as a kid. Swing the rope over your head and jump over it; rinse and repeat. This motion might not be that natural for everyone, particularly taller athletes,so taking some time to build the muscle memory and coordination is a good idea. Once you've built the foundation, you can start having more fun and maximizing the exercise potential. You can try to speed up your jumping. You can mix up your jumps: high step jumps, in particular, are great for getting a better workout. You can go for longer periods of time: shoot for five minutes straight first, then 10 minutes, then 15 and so on. As you make your jump roping more and more intensive, you will find yourself breaking a sweat and feeling the burn in your leg, arm, and shoulder muscles. As with hand weights and balance boards, the internet is your best friend in building a cohesive and effective workout from skipping rope. There are numerous videos and guides out there that can help you get imaginative with your jump roping and develop it into a tried and true workout. Just because you don?t have the money or space for a stationary bike doesn't mean you can't enjoy the workout benefits of cycling indoors. If you own a bicycle, your best bet for a home workout might be a resistance trainer. These apparatuses are basically just stands for your bicycle that can turn it into a compact and effective indoor resistance trainer. You don't even have to take the wheels off your bike. Just bring it inside, set it up on the resistance trainer, and go! You'll be able to ride your bike in front of your TV, for a fraction of the price you'd pay for a stationary bike. On days when your usual cycling workout gets rained out or wrecked by a snowstorm, a resistance trainer will be your best friend. Exercise balls provide lots of creative ways to tone your muscles?from your triceps to your abs and beyond. You can use an exercise ball for twists on basic push-ups, crunches, sit-ups, plank workouts, and much more. If you're drawing a blank for what sort of workout to do with an exercise ball, just hit the web for plenty of resources. You might feel a bit silly at first, playing around on a big inflatable ball. Eventually, though, as you begin to feel a noticeable burn in your core muscles, you might just want to include exercise ball workouts in your routine every day. If you're used to breaking a sweat at the gym, a yoga workout might not feel much like a workout at all. However, working through basic yoga routines, with or without a video to guide you?is terrific for your muscles, your flexibility, and the overall well-being of your body and mind. You don't necessarily have to have a yoga mat to do a yoga workout?particularly if you have a nice carpeted place to work out. However, a mat will make it so you can do your workouts anywhere?whether on carpet, hardwood, or tile. Pull ups and chin ups are among the most difficult exercises in the fitness world. However, they are also some of the most beneficial. The effort that it takes to do a single pull up or chin up (let alone numerous repetitions of both) can help build up nearly all of your upper body muscles. Indeed, the list of muscles that benefit from pull ups or chin ups includes the biceps, the triceps, the shoulders, all of your back and shoulder muscles, your abs, and even the muscles in your hands. With pull up bar kits, it's easy to install an unobtrusive bar on your wall or in your doorframe. You can get better at pull ups or chin ups in the comfort of your own home, without being worried about someone at the gym judging you because you can only do a couple. Over time, you'll find yourself getting stronger and your muscles becoming more defined. In a jam, you can make a home workout from stretching and exercises like push-ups, sit-ups, crunches, planking, lunges, and squats. However, those exercises can get boring pretty quickly, so it's important to have a few other options at your disposal. 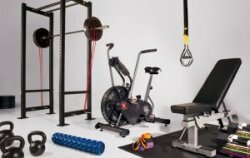 By investing in just a few of the affordable accessories above, you will be able to build a better, more effective, and more enjoyable home workout. Your home exercise routines still might not replace your usual gym or outdoor workouts, but they will help you stay fit on the days when at-home workouts are the only available choice.